Discussion in 'GBAtemp & Scene News' started by Another World, Mar 5, 2011. 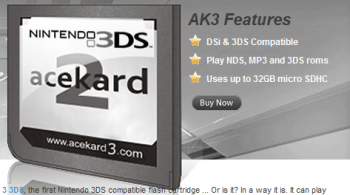 A new Web site has popped up selling the Acekard 3 for the 3DS. This card is a clone/fake which Acekard themselves have warned users about. Please be aware that this is not a real Acekard when making any future purchases. This card will not be supported by AKAIO, Acekard, or the new Acekard anti-counterfeit code system. I love how's there a big 2 on the sticker. Haven't we seen this one before? Is there something different about it now? I like how on the homepage, the girl is listening to music from something not 3DSy at all. The buy now link just redirect to a crappy r4 shop, the acekard section does not contain that acekard3. No point in buying that crap (especially since I have a M3iZero/DSTWO that are already ready for 3DS). But unfortunately, many people will actually buy it (and probably even more if this thing had "R4" on it's name). i do believe the site is from june 2010, but with the 3ds about to be released in north america and acekard's new anti-counterfeit system, it made sense to make a post that this card was a fake. is it a real acekard but there saying that its a just for the 3ds? They'll make the effort to make a fake Acekard 3 for 3DS, but not actually change the big TWO printed on it. Not supporting them, but how could they miss such a thing? There is no Acekard 3, it is fake. no is the card it self a real acekard or a fake not that its a acekard 3.